Last Wednesday, the finance ministry said that the autonomy for the RBI “is an essential” and both the government and the RBI have to be “guided by public interest and the requirements of the Indian economy”. The Finance Ministry claims that the existing economic capital framework — which governs the RBI’s capital requirements and terms for the transfer of its reserves to the government — is based on a very “conservative” assessment of risk by the central bank. Sources have confirmed to The Indian Express that the RBI views this attempt by the Government to dip into its reserves can adversely impact macro-economic stability. And so the RBI has not accepted the proposed changes, sources said. For its part, the Finance Ministry argues that the current framework was “unilaterally” adopted by the RBI in July 2017 because both the government nominees on the Board were not present during the meeting. The government did not accede to this framework and has since then been constantly seeking discussions with the RBI. 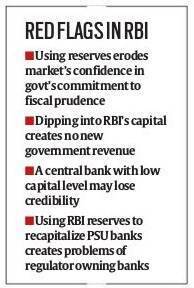 The government is of the view that RBI has over-estimated its capital reserves requirements resulting in excess capital of Rs 3.6 lakh crore. That’s why, sources said, the government has proposed that the use of these funds be decided in consultation with the RBI. These funds can be used, for example, to recapitalise public sector banks, help them expand their loan book and come out of the Prompt Corrective Action framework. The RBI, however, feels strongly that using central bank reserves has pitfalls. In its opinion, this does not tantamount to any fresh income, and was essentially in the nature of issuing new securities to fund government expenditure. Not only does it hurt the government’s commitment to fiscal prudence, it also affects the confidence of the financial markets. 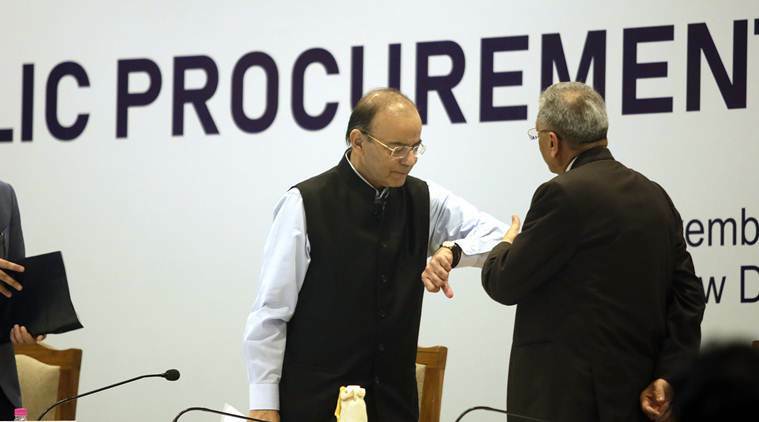 The finance ministry has also raised objections to the staggered surplus distribution policy (SSDP) of the central bank, under which the RBI transfers its surplus to the government. The ministry’s view is that RBI has been “conservative” and at times “arbitrary,” especially when it came to the transfer of the interim surplus. Sources said the ministry proposed that from 2017-18, the RBI should transfer the entire surplus to the government after taking into account its capital requirement. This is another area where the government and the RBI differ. In 2017-18, the RBI transferred a surplus of Rs 50,000 crore to the government (comprising an interim transfer of Rs 10,000 crore), up from Rs 30,659 crore in 2016-17, but lower than in the previous three years. The government believes that, when compared with global central banks, the RBI holds much higher total capital as a percentage of its total assets (at about 28 per cent). Countries including the US, the UK, Argentina, France, Singapore maintain much lower capital as a percentage of total assets, while the same for countries including Malaysia, Norway and Russia are much higher than India. The RBI maintains various types of reserves to cover various risks including market risk, operational risk, credit risk and contingency risk. 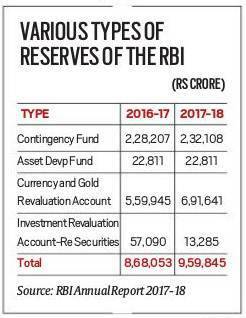 For the year ending June 2018, RBI had total reserves of Rs 9.59 lakh crore, comprising mainly currency and gold revaluation account (Rs 6.91 lakh crore) and contingency fund (Rs 2.32 lakh crore). While Contingency Fund represents the provisions made for unforeseen contingencies, the Currency and Gold Revaluation Account represent unrealised marked to market gains/losses. In his speech on October 26, which brought into open the tussle between the finance ministry and the central bank, RBI Deputy Governor Viral Acharya said how a transfer of excess reserves from a central bank to government can be “catastrophic,” as had been proven in the case of Argentina. The transfer of $6.6 billion of its central bank’s reserves to the national treasury, sparked off “the worst constitutional crises in Argentina and led to “a grave reassessment of its sovereign risk”, Acharya asserted. Last Wednesday, the finance ministry said that the autonomy for the RBI “is an essential” and both the government and the RBI have to be “guided by public interest and the requirements of the Indian economy”. The government tried to defuse the tension in its relations with the RBI, which soured over the ministry starting consultations over a range of issues with the central bank under the Section 7 of the RBI Act. Queries sent to the finance ministry and the RBI seeking comments for the story did not elicit any response. Many economists and expert committees have in the past argued that the RBI is holding much higher capital that required to cover all its risks and contingencies. Former Chief Economic Adviser Arvind Subramanian said in Economic Survey 2016-17 that the RBI is “is already exceptionally highly capitalized” and nearly Rs 4 lakh crore of its capital transfer to the government can be used for recapitalizing the banks and/or recapitalizing a Public Sector Asset Rehabilitation Agency. This proposal was opposed by the then RBI Governor Raghuram Rajan. The Malegam Committee in 2013 estimated that the RBI was holding Rs 1.49 lakh crore of reserves and buffers in excess of its requirements.